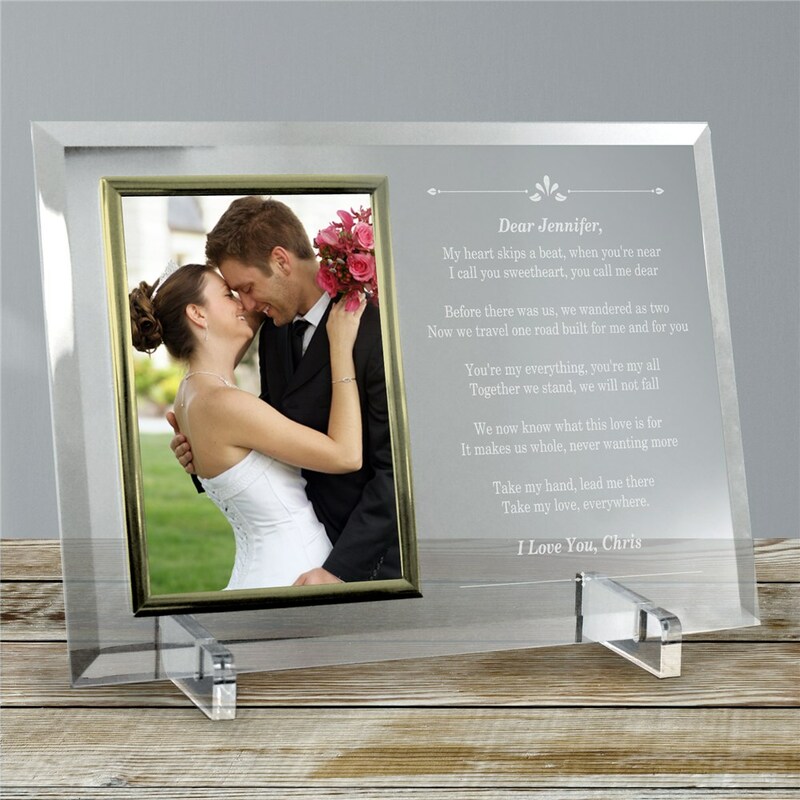 Our beautiful Engraved Couple Glass Personalized Picture Frames will make any romance stay alive forever. You can personalize these Customized Picture Frames with a Love Poem that makes a great gift for that special person in your life. Our Personalized Romantic Beveled Glass Picture Frame is a heavy-weight glass with beveled edges on all sides, accented with golden brass frame trim. Frame measures 8" x 11" and holds your 4" x 6" photo; includes clear easel legs for top display. Includes FREE Personalization! Choose our Poem... I'm glad there's you and personalize with any name on top and any one line message after the poem or Create Your Own Poem. Write Your Own can be personalized with 40 characters per line and a maximum of 20 lines. I was very impressed with how beautiful this item turned out. It was perfect for what I purchased it for. My only issue was the engraving was done in white, which was very readable on the web site, but on the actual product, the white lettering on the clear crystal was very difficult to read. I wish the engraving had been darker somehow, or maybe a darker color. You have to "tilt" the frame to read the whole poem. But the item is so beautiful it's hard to really fault the difficulty in reading it. This difficulty in reading it reduces my rating to 4 stars. I would not hesitate to purchase from here again, I'll just pay more attention to the engraving colors. I bought this for my girl friend as a gift before we got engaged. She then bought one for each of her brides maids. Thanks for the gift idea!